The Winter of 1965-66 was a depressing time to be a Doctor Who companion. Fresh off the death and destruction of the Daleks’ Master Plan, The Massacre (sometimes called The Massacre of St. Bartholomew’s Eve) returns us to France for the first time since the Season 1 finale just in time for the slaughter of thousands of Protestants. It’s pretty typical Who fare until the final episode when the Doctor figures out exactly what’s about to happen (and even then it doesn’t stray too far). The Doctor is extremely excited to go and meet an apothecary in the city somewhere and leaves Steven on his own. Other than his conversation with the apothecary we don’t see the Doctor again until the second half of the final episode. I would say he was on vacation, but we do see Hartnell acting as the Abbott. At any rate, this story’s focus is on Steven’s quest to find the Doctor. Due to Hartnell’s double role, there is some suspense over the Abbott’s identity, which is really the most interesting part of the time in France. Of course, the Doctor is not the Abbott, just a doppleganger. Steven befriends Nicholas and Gaston, two Huguenots (French Protestants) during a bitter feud with the Catholic monarchy. Gaston is employed by Prince Henri, just married to the Catholic Princess Marguerite. The story’s plot revolves around the mysterious identity/assassination of the Sea Beggar and the tension between the opposed religious camps. The Sea Beggar turns out to be the Admiral, the top Protestant in the government. The Abbot has arranged his assassination. These characters are predictably forgettable. In fact, a couple of days went by between watching the second and third episode and I had some trouble telling them apart. In the meantime, Steven has come under the suspicion of his new friends. When the Doctor does not return they being to think he may be working as a spy for the Catholics. A trip to the Apothecary’s does not pan out and matters are not helped when Anne Chaplet, the Abbott’s servant girl, arrives. Steven and Anne eventually flee, visit the Abbott and learn of the assassination plot.. They attempt to warn Gaston, but have to flee again, going into hiding at the Apothecary’s. Meanwhile, the assassination fails and the Abbott is blamed and killed. Steven, still thinking that the Abbott is the Doctor visits the body, but is chased back to the Apothecary. Reunited with Anne he begins to despair. Fearing the Doctor is dead and with no way to get into the TARDIS he’s not sure what to do next. At this point the Doctor appears. There is no explanation of where he was. If he wasn’t the Abbott, what was he up to? This is a pretty major plot point that isn’t explained. It bothered me a bit, but more on a sidenote humorous wtf? way than in any negative way. At any rate, when Anne tells him the date and the year he realizes that the Protestants are about to be slaughtered and says that he and Steven must leave immediately. He tells Anne to go to her Aunt’s house. After a tense sprint, Steven and the Doctor get out just in time. This is one of the increasingly rare educational episodes. And I learned something! I’ve seen references to the Huguenots often but have never bothered to find out exactly who they were. Now I know! French Protestant that were slaughtered in the 16th century by the Catholic monarchy, mostly led by Catherine de Medici, the ruthless Queen. I feel smarter for having watched Doctor Who, and not just because I watched Doctor Who. This is the point at which the story departs from the track a bit. After learning the fate of his friends Nicholas, Gaston and Anne, Steven insists that he is done with Doctor whom he feels could have saved Anne. The TARDIS lands in 20th century London and Steven leaves. In a very touching monologue, the Doctor laments the loss of yet another friend. Hartnell plays this moment perfectly. We really get a sense of how truly lonely he is, saying that they just don’t understand and regrets that they are always in such a hurry to get home. He even briefly reminisces about Susan, whom he hasn’t mentioned in a long time. When Dodo (short for Dorthea), a young girl looking for a telephone, bursts in he sadly tells her to leave because he has no telephone. I have to admit that I really felt for the Doctor during these scenes. His humanity shows through in a way that it doesn’t do very often. In fact, I don’t think we’ve seen this side of him since Susan’s departure. It was a touching moment that was highlighted even more in the next scene. Steven returns and tells the Doctor they have to leave before the police arrive. Dodo, still in the TARDIS, seems happy to go, claiming she has no family. Her last name is Chaplet and Steven wonders if maybe she is descended from Anne who may have somehow survived. The Doctor notices that she is very similar in appearance to Susan and sounds genuinely happy to have regained friends. Those that travel with him are his family and now Dodo, previously without family has a new one.I really got the sense, for the first time, that the travelers are to be understood as a family. This has been hinted at before, with the Doctor’s reluctance to send Ian and Barbara home and his relationship with Vicki. But in these scenes it’s really made explicit. For the most part the story is rather ho-hum. As I mentioned, it’s typical Who fare. The closing scenes in London, however, really provide the Doctor with an added depth of character and act as decent introduction to Dodo, our new companion. I truly did believe that Steven was leaving and was pretty surprised by it. I thought maybe they would end the story with the Doctor completely alone. It would have been quite the ending, but the reunion made it better. Steven is still around for awhile. As for Dodo, she is IMO the 2nd most unfairly maligned companion in DW history. That’s not to say she’s my favorite, but she’s done nothing to deserve the terrible treatment she’s recieved in many corners of fandom. And ah yes the doppelganger plot device. 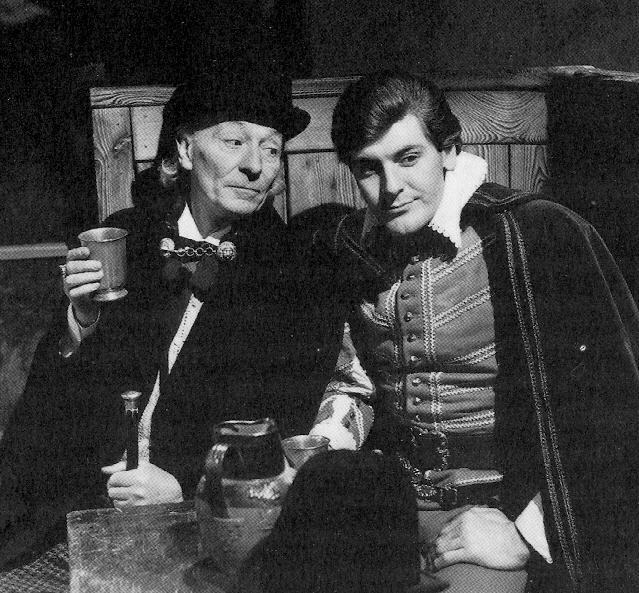 This will not be the last time you see it, though it may be the only Hartnell one. With 26 odd seasons of classic Who and 4 (soon to be 5) seasons of New Who, I think you’ll find that the majority are ‘typical Who fare’ though what that means will change slightly over time. Within a few seasons pure historicals will be a thing of the past (no pun intended). So onward to The Ark! Which I haven’t actually seen or heard so that should be interesting. I think that’ll be the 1st one you review that I haven’t experienced. I’ve decided that if you can attempt to review every DW TV story in existance, then I can at least attempt to comment on all of them. Cheers. By typical who fare, i don’t mean bad. Just unremarkable. And as story ideas get used up, more and more stories, i would expect, would be typical. As for Dodo’s bad reputation….after already starting the Ark, I can see some potential frustration. She’s kind of a bad combination of Vicki and Susan. I can imagine that as her character develops she changes, but maybe not. That could lead to a bad reputation. I’ll be interested to see how she actually turns out. As for the Ark, I’m halfway through (I’ve been on a roll for the last week!) and it’s pretty good. I would recommend it so far. And, while I love to get comments, I think your attempt to comment on all reviews might be as rough as my attempt to watch and review all serials. Thanks for your dedication!